Hey all, this is a guest contribution from Murli Pillai, the man, the myth, the legend behind the awesome Fedberg End of Season Quiz I posted in December. Enjoy! It all started with Jimmy Connors. For me at least. Never liked the guy though. Too brash for my cash. Then came Borg with the rock star looks, unflappable temperament and ugly game. He was my connection to rock and tennis, the double-handed backhand notwithstanding. But he quit too soon, succumbed to pressure. Not the ideal connection, so to speak. Enter Superbrat – naturally talented, emotionally volatile. McEnrowing and railing all the time. Well where do we go from here. Ivan the Terrible. And who could be blander than Wilander. It was yawn-tennis all the way. Boom-Boom came – all serve and dives. All power and no finesse. Till July 1988. Wimbledon semifinals. ‘The Big Cat’ Miloslav Mecir vs Stefan the Swede. The Swede didn't have the Borg type rock star looks. More hangdog as he lost the first two sets. Then came roaring to win the next two and finally trailing in the 5th by a break but again coming back to win the match and then go on to beat Boom-Boom in the finals. Grace vs Power. Elegance vs Athleticism. I was hooked. The real first breath of fresh air. Then came 1996. Stefan called it a day. The day the tennis died. For me yes. The Sampras's, the Agassi's, the Couriers and many other great players went about winning grand slams, notching up records et al. But I wasn't there. Tuned off, logged out. I had called it a day too. End of story? No way. 6th July 2003. The green, green, grass of Wimbledon. On one side stood Aussie Mark Phillippousis aka Scud – more a stud than anybody else, and on the other side a long-haired youngster with rock-star looks. Took me back to the flower-power days where grass didn't mean Wimbledon. But back to Wimbledon. It was sheer magic on one side of the court. Magic, ballet, rock & roll, symphony, precision – all there on display. My posterior was glued to the sofa and my eyes to the TV. My drink had reduced a wee bit more due to evaporation than any imbibement from my side. And as the Fedexpress slumped on the ground and burst into tears after winning two tie-breakers and breaking Scud twice in the second set. I was a changed man. Tennis had surely not died. Had only gone into hiding – just to surface on that momentous day. At least for me and maybe for millions around the world. But this journey didn't begin at Wimbledon. 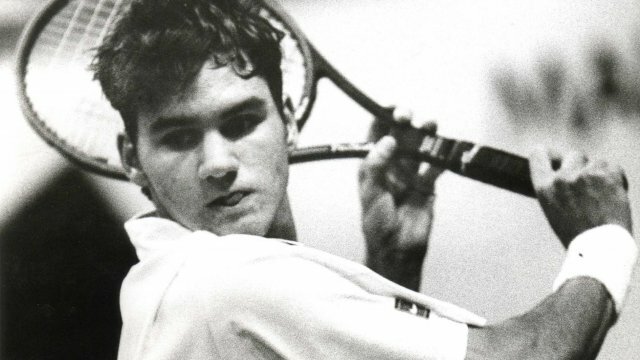 It all started on an indoor court in Toulouse on 28th of September 1998, when a certain 28 year-old Frenchman Gillaume Raoux ranked 45 became part of history when he lost to a gangling youth ranked 878 and just 17 years old. Ladies and gentlemen, welcome Roger Federer. This journey doesn’t seem like stopping 17 years later, 17 Grand Slam titles later, 4 children later, 999 match-wins later as we move to 11/1/2015. Here was that journeyman on the threshold of a monumental achievement as he takes on Milos Raonic of Canada at Brisbane, Australia. Playing for the title. 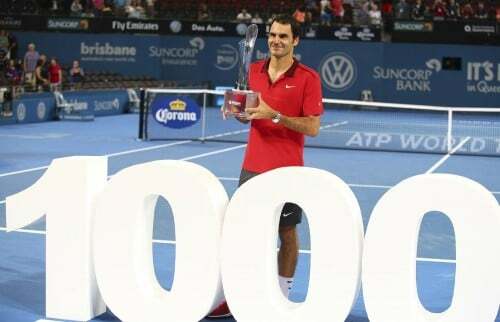 Playing to win his 1000th ATP match. Playing in front of his twin daughters. Playing in front of his idols. Playing a man 9 years his junior. Again the same match-up. Grace vs Power. Will power overhaul grace? Will youth triumph? Will 1000 be a momentous number and not an unceremonious first round win at the ensuing Australian Open. Would the ‘old man’ win? Would the ‘daddy’ win in front of his twin daughters? Would the ‘idol of millions’ not let his fans down? I had no doubt in my mind. Neither did he, I am sure. And so it transpired. 1000 happened. Wasn’t easy, but what the hell. Its a long way to the top ( if you want to rock & roll ) right. Match over. 83rd Title won. 1000th match won. All over barring a few questions. Questions in all our minds. Why is it that this man can achieve all of what a few others can achieve only a part of? Why is it that this icon can still remain grounded despite all his achievements? Why is it that every other major sportsperson in the world is in awe of him? Come to think of it, because he of the thousand wins is much much more than the sum of all. Sum of all that have played tennis with their limited capabilities – the coolness of Borg, the talent of McEnroe, the longevity of Connors, the determination of Lendl, the power of Becker, the charisma of Agassi & Safin, the doggedness of Hewitt, the sportsmanship of Rafter, the all-court game of Sampras and the elegance and ethereality of Edberg. A sum much greater than all the parts. The GOAT. Omg 3rd! !i like these guest posts!! Podium again!! Nice read, took me back as well with all your memories. Edberg totally agree! Kickstarted it all again altho I did love Connors! That will to win and giving 150% I hv always liked! But no one comes even close to Federer! Hey Murli, great post. Loved it. Really did. Please keep writing in such a beautiful way. Awesome post! Makes me wish I was alive to see the days of Edberg’s career. And there’ll be people just like me in thirty years saying the same thing about Roger. How blessed we all are. In my lifetime at least no athlete comes close to topping him. It’s a toss up between Fed and Frank Bruno for me. I think if Fed wins another slam I will put him as number 1. But then again he hasn’t had a successful panto career yet. Real tough call. Super fun post, a flower powered Murlii! The style, the play-on words, absolutely loved it, especially well-said the last paragraph “the sum of all”. Yes, Roger the GOAT, one and only. So you live in Muscat? Hey I’ve been there twice, though a long time ago. Wonder how’s life there now…? Muscat is one of those places that just sounds cool from the name. I have no idea what is there or any famous landmarks but based on the name I’d visit. As far as I remember the capital of Oman was a neat, modern city even back then (compared to Yemen’s Sana’a for instance), with some great beaches as well. But the most of time I was out in the desert (Wahiba Sands), wadis and mountain range (Jebel Akhdar). A beautiful country. Perhaps Murli could tell you better. Federer the ONE? Maybe the Oracle was wrong after all. I hv a similar great memory of going to see Edberg v Becker on a rainy Monday in ’88, final held over from Sunday! Atrocious weather, people’s final and Edberg winning! Just great! Excellent post Murli! Thanks for recapping all the old greats. I had much the same feelings as you as I watched them over the years. Until Federer, no one really touched the scope of what he can do on (and off) the court. Excellent article .. Enjoyed reading every word to the core. Hoping for 1007 at the Aus Open. Awesome writing! Atta hero we’ve got,, Mr. Roger M Federer! Great read.. thanks Murli! Roger does personify those traits. So hopefully we all have a couple of years to keep enjoying his game.. Roll on AO! Entertaining reading, but I don’t think in 1970 or ’80 we were simply waiting for Roger to come along, as he did in ’98 (or 2003 Wimbledon). The best then was the best of its era and at the time we couldn’t imagine what might be better to come. Changes in equipment have had a tremendous effect on the development of the game. Roger understands that, and shows enormous respect for the great players of the past (as he did wth Laver and ‘Emo’ in Brisbane). He is part of a tradition and no player is bigger than the game. Who knows the praises fans will be singing of the heroes of the future? I also make no secret of that fact that I consider the game has changed dramatically in the last decade because we have entered one of the worst doping eras of professional sport. A Russian whistleblower has recently said that “99% of Russian athletes are doping”. Lord Coe says track and field is facing its worst crisis since the Ben Johnson episode of ’88. Yet track has way tougher doping controls than tennis. Regrettably, no sport gets a clean pass, and no player – no matter how great. A sign of the times. Not all changes are about progress. The article gives the impression that there was no real tennis played before Roger. Sure, that’s just his opinion but that’s not how I remember the game – and that’s my opinion. He also writes about how the game has evolved through its champions. Fair enough. But it has also been evolving for other reasons, the most conspicuous of which is doping. And that’s a fact. Of course I realise Roger’s shorts are much more interesting to most fans. It’s not my style to denigrate guest posts made here by our dear, fellow readers. It’s an opinion, after all. But this one I will take with, as they say, with a grain of salt. I don’t think any of those players before Roger Federer had limited capabilities. Technically, everyone is limited. However, in their era, they were the most capable. Roger Federer is no more capable than them. And he certainly has his own limitations. The win percentage for Roger on the three major surfaces isn’t exactly miles ahead of those greats. It’s actually quite bad on clay if you check it out. Roger Federer has limitations. And several limitations. He plays the most beautiful tennis of all though, and that can’t be argued. I have to agree with Richard. The GOAT being greater than the sum of all parts, or previous greats, is grossly inaccurate, and is a mild insult to the great man himself, who, as Richard pointed out, has nothing but respect for them. Hi ladies, have you seen Roger’s (and Rafa’s) new outfit yet? Omg, short shorts! I nearly fainted. Post coming today on that 🙂 I’m not a fan of it. Lol, you mean the short (and tight) shorts or the outfit? I’m certainly not a fan of the tennis ball coulour, though. Look forward to the post! Too short, am worried already! Hope they are strong! !gtg Where are the polos?? Great writing & I enjoyed reading it. You surely are Fedex Fan No.1. Quite an athlete & he just keeps going. Great post, and so well written. A real pleasure to read. and I love the black and white photo of the young Roger. Thanks for taking the trouble to write. I think the length of the shorts is just fine. It’s nowhere near as short as it used to be back in the 70s and 80s! Man, I so remember how short Borg’s shorts were. Now, he had gorgeous legs, so I didn’t mind. But I thought both Connors and J-Mac should have covered up more, ha! Thanks so much for your heartening and encouraging comments. I responded individually because I really appreciate it. Would love to contribute again. Of course a certain Mr. Roger Federer has to trigger it and for sure he will and soon I hope. Its action time from Monday.